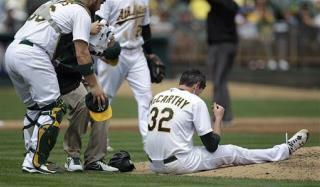 (Newser) – The Oakland A's are in the thick of a playoff race, but players have a way more pressing situation to keep an eye on: A's pitcher Brandon McCarthy is in the hospital recovering from brain surgery after getting hit on the head by a line drive Wednesday. McCarthy was able to walk off the field, but he suffered an "epidural hemorrhage, brain contusion, and skull fracture," reports AP. He had surgery that same night to relieve pressure, and looks to be making good progress. I've played baseball and football, baseball is more dangerous in my opinion, especially for pitchers. Maybe the NCAA might wake up and ban metal bats. That's one dangerous place to be standing. Better protective gear, more like what the catcher wears. I recall many fine days and nights on the ball diamond throughout southern Ontario, both as a boy and since, and I've always been amazed this doesn't happen more often. One senior league game I was at a fella broke his ankle stealing second.